50-year-old male who presented with worsening gait, neck pain, upper extremity pain, numbness, and occasional bowel and bladder incontinence. The patient complained of increasing difficulty walking, neck stiffness, and leg cramps, increasing upper extremity numbness, and dysthesia in hands and forearms. 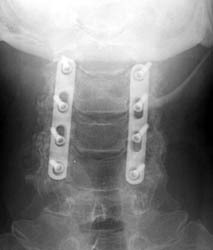 The patient underwent C3-6 laminectomies with postero-lateral fusions. 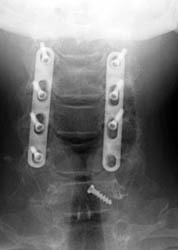 AP and lateral radiographs taken 5 days after surgery demonstrate typical laminectomy defects at C3-6. The posterolateral fusions appear intact with bone grafting material faintly appreciated. 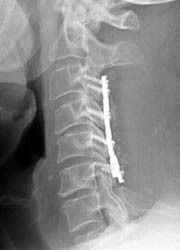 The screws and plates are intact and in appropriate positioning. AP and lateral radiographs taken 5 days later, while still in the hospital. Note migration of left C6 screw. It has loosened and fallen out. 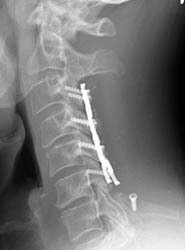 This screw was not causing symptoms and decision was made to conservatively manage the patient and keep in rigid cervical collar until the bone graft matured in 2-3 months.